The Nintendo Entertainment System -- the NES -- is one of the best and most beloved consoles of all-time. And for good reason. But, speaking objectively, it isn't a guitar. But what if it was? Guitendo is a small specialized shop that offers electric string instruments made from video game consoles, including a NES Classic stuck in the shell of a NES, that's also a guitar. I know, awesome. The standard NES Guitar model Guitendo offers is built from a non-working unit, a six-string electric guitar, a fixed bridge, 25.5 inch scale neck, single pickup, single volume control, professional set-up and intonation, and your choice of accent color. There is also the option to have both right-handed or left-handed configurations at no addition cost, as well as other additions, such as a kill switch, though these type of add-ons will cost you. Meanwhile, if you're more of a bassist, the company also offers a NES Bass for $475, which is $25 more than the electric guitar. According to Guitendo, re-purposes or recycled parts are used whenever possible. "It’s important to me to use instruments that were ignored or unloved — and I spend most of my free time collecting such things so that I can bring new life and purpose to them," writes Randy Garcia, the founder of the company. As mentioned above, Garcia normally treks in making guitars from broken and unplayable systems, but he is open to custom jobs, if they are feasible. 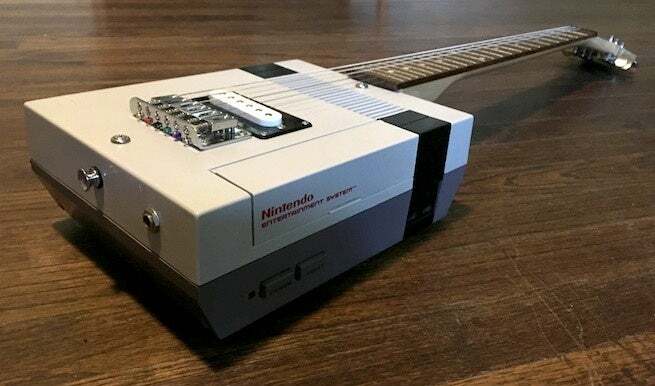 One example of this is a new NES guitar that rather than feature just a dead NES, features the casing of an NES, but with a working NES Classic on the inside so that you can play guitar and some Mario at the same time. Or if you're more of a PlayStation gamer, there's also a PS2 guitar, dubbed BassStation2, though it isn't functioning. To buy the NES Classic guitar with a functioning NES Classic mini or Raspberry Pi inside, here's the listing on Reverb. If you don't have that kind of cash at the moment, there's a free giveaway going on for one, also courtesy of Reverb. You can find that here. For any of Guitendo's other products or for potentially your own special order, head to the official website and shoot Garcia an email.